Welcome to our series of tutorials on the upcoming Windows 10. In this tutorial you will learn how to boot into Advanced Startup Options in Windows 10. Advanced Startup Options have some powerful tools which can be used for troubleshooting if the computer is having problems and also change the behavior of Windows at start up like booting up in safe mode. Windows 10 offers a quick and easy way of booting into Advanced Startup mode. To do so open Start Menu and click on Shutdown button. Now press Shift key and without releasing it click on Restart option. Windows 10 will now reboot into Advanced Startup Options. Another way of booting into Advanced Startup Options is via the USB recovery drive we created in last tutorial. 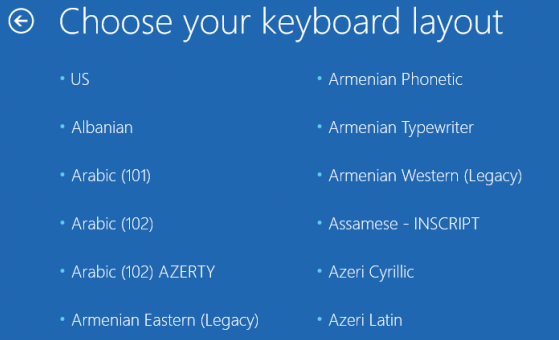 Just boot your computer using the USB recovery drive and select your keyboard language. You can also reboot the computer into Advanced Startup Options from Settings app. To do so, open Settings and click on Update & recovery icon. Here select Recovery from options on left side and then click Restart Now under Advanced Startup.